As TASvideos.org has grown and changed, so have the tools used to create the content found within it. These movies benefited from only marginally better tools than those available in 2004, and the tools we have at our disposal today almost guarantee that improvements are possible. So if you're new to TASing, or a veteran looking for your next project, take a look at these movies and see just how much you can make them better! NES Battletoads (USA) "warpless, 2 players" in 24:57.47 by nesrocks. This run has two players and does not use warps. As always, a bug on level 11 prevents player 2 from moving, so he gets a game over for that level. Player 1 plays level 11 alone and player 2 comes back for level 12. 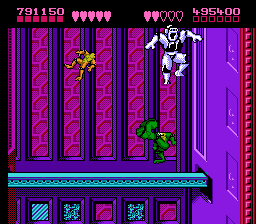 This is a bug in Battletoads itself. SNES Kirby Super Star (USA) in 41:56.17 by nitsuja. 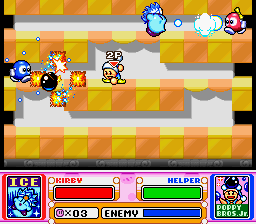 Kirby Super Star is a consolidation of eight Kirby games in one. Since most of the games must be completed to reach the credits, this movie is fairly long. The author, nitsuja, controls both players when applicable rather than letting the CPU operate the helper. For those interested, the obsoleted movie uses only one controller. This accounts for the large time difference between the two movies. SNES Lagoon (USA) in 1:08:32.68 by OmnipotentEntity. Lagoon is a low-tempo adventure game much like Zelda. 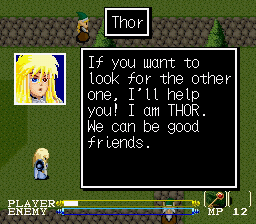 It is up to Nasir, Hero of Light, to save Lakeland from Zerah. Zerah is attempting to release the Evil Sprit and pollute all the water. This game is difficult due to the length of Nasir's sword. SNES Secret of Evermore (USA v1.0) "100%" in 2:04:06.12 by Saturn. Shapeshifting dogs. Evil robots. Alchemy. Cheesy B movie references. These are all par for the course in Secret of Evermore, a very loose "sequel" to Secret of Mana. The story follows a boy that is thrust into a virtual world and finds himself with no immediate means to escape. As the boy travels, the geography changes to reflect certain eras of real-life history, adding a unique aspect to the game. The author has aimed for fastest time with 100% completion. 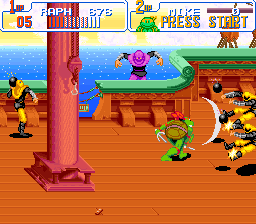 SNES Teenage Mutant Ninja Turtles IV: Turtles in Time (USA) in 18:55.0 by nitsuja. Here you can see a revision of this game by nitsuja, 4:35.31 minutes faster the previous run by mazzeneko. The strategy used was changed radically, using Raphael instead ofDonatello and using dash moves more often. The damage for every move was mapped out carefully by monitoring the internal values of the RAM, to be able to choose the best attack for every situation. Luck was manipulated to make some enemies appear in more convenient positions. 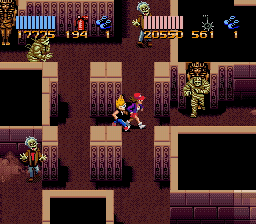 SNES Zombies Ate My Neighbors (USA) "all victims saved" in 59:14.87 by Walker Boh. This game involves slaying zombies and rescuing people, displayed from an overhead perspective. It's reminiscent of Fester's Quest but is much more fun. 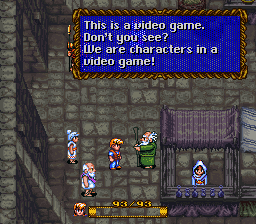 Walker Boh controls both characters simultaneously, making this hard game even harder. Naturally, luck and glitches are abused in this run. We recommend reading the author's comments; he wrote quite a detailed article of this movie.